Lebanon NH – On November 2, 2018 at approximately 11:15PM, the Lebanon Police Department received multiple reports of gunshots in the area of North Main Street and Fountain Way in Lebanon. Responding officers were checking the area of North Main Street for any involved parties when Sgt. Rich Norris observed a black Ford Fusion in the Boston Lot Lake parking lot. The vehicle was consistent with the description of a possible suspect vehicle in the shooting that had occurred in Hanover, NH earlier in the evening. As Sgt. Norris attempted to investigate this vehicle further, the vehicle fled northerly on North Main Street and attempted to evade the officer. The vehicle was subsequently involved in a single car motor vehicle accident on Oak Ridge Road, after which two subjects were taken into custody and a Taurus 9mm pistol was recovered in the middle of the roadway near the crashed vehicle. After a subsequent investigation, Gage Young, age 22 of Oak Ridge Road in Lebanon, was charged with Reckless Conduct and Falsifying Physical Evidence, both Class B Felony charges. It is alleged that Young fired the Taurus pistol in the area of North Main Street and Fountain Way prior to being involved in the pursuit and that Young attempted to discard the pistol after the vehicle had crashed. Young was transferred to the custody of the Hanover Police Department to face charges involving the shooting incident in their town. The driver, Hector Correa, age 17 of Lebanon, NH, was charged with Disobeying a Police Officer, Class A Misdemeanor, and was later released on a summons to appear in the 2nd Circuit Court, Lebanon District Division, on December 17, 2018. Hanover NH- Earlier this morning the Hanover Police Department reported it was investigating a shooting that occurred on November 2, 2018 at approximately 9:45 PM on School Street in Hanover, NH. 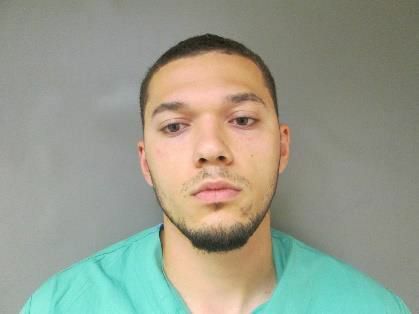 At 2:47 PM today, Hanover Police arrested Gage YOUNG, age 22 of Lebanon, New Hampshire for Second Degree Assault, RSA 631:2, a class B Felony in connection with this investigation. Our preliminary investigation has revealed Mr. Young was traveling through the Town of Hanover when he discharged a handgun toward the 19-year-old victim, striking him and causing serious bodily injury. The victim continues to be in stable condition. We would like to thank the Lebanon, Canaan, Enfield, Plainfield, Lyme and Norwich Police Departments, along with the Grafton County Sheriffs Office, New Hampshire State Police, and Hanover Fire Department for their assistance in this investigation. Dartmouth Safety & Security and Dartmouth’s Emergency Management Team coordinated with Hanover Public Safety during the early stages of our response to ensure the safety of the Dartmouth Community. We want to assure our community that we continue to work on this case and appreciate all information anyone may have as it relates to this crime. Please contact us at (603) 643-2222. 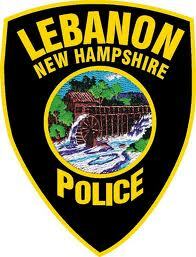 Lebanon NH – On November 2, 2018 at approximately 11:15PM the Lebanon Police Department received multiple calls reporting gunshots in the area of North Main Street and Fountain Way. Lebanon Police Officers responded to the area to investigate. This incident remains under investigation. The Lebanon Police Department is asking anyone who may have seen a suspicious vehicle or individuals, or has any information, to contact the Lebanon Police Department at 603-448-1212. Lebanon NH – On November 2, 2018 at approximately 11:25PM, Sgt. Rich Norris observed a suspicious vehicle parked in the lot of the Boston Lot Lake on Route 10 in Lebanon. As Sgt. Norris attempted to investigate the vehicle, the vehicle fled north on Route 10 and attempted to evade the officer. The vehicle, a Black 2010 Ford Fusion, later crashed on Oak Ridge Road after the brief pursuit. A 17-year-old male and a 22-year-old male were taken into custody at the scene and transported to the Lebanon Police Department for processing. Neither subject was injured in the crash. The Lebanon Police Department is continuing to investigate this matter and will release additional information when appropriate. Hanover NH – On Friday, November 2, 2018, at approximately 9:45 PM, Hanover Communication Center received a 911 call for a possible gunshot victim on School Street near the Christian Science Reading Room. 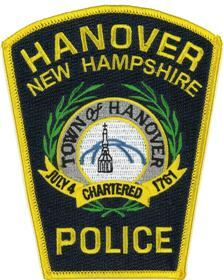 Hanover Police, Fire, and EMS personnel responded to the scene. Upon arrival, officers located a 19-year old male subject that was injured and on the ground. EMS personnel treated the male subject and then transported him to Dartmouth-Hitchcock Medical Center where he was listed in stable condition. This incident is in the early stages of investigation and is on-going. Hanover Police is requesting that anyone in the area of School Street, W. Wheelock Street, and Allen Street that may of heard or seen anything, including vehicles coming and going to contact us at (603) 643-2222. 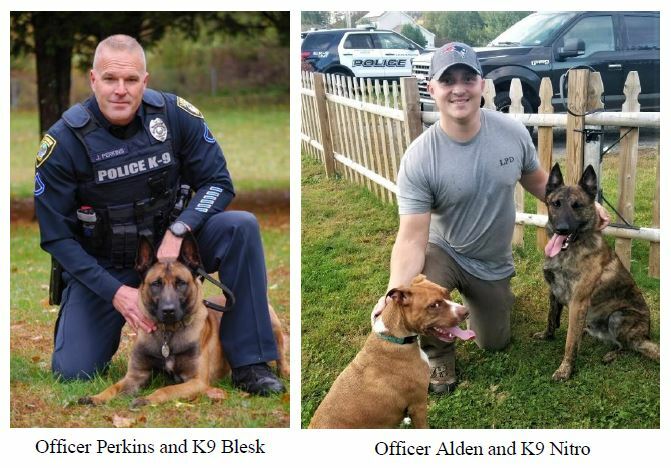 Lebanon NH – On Saturday, November 10, 2018, the Lebanon Police Department and West Lebanon Feed and Supply invite the community to meet the newest members of the K9 Unit. Officer Jeremy Perkins and K9 Blesk recently completed training at the Vermont Police Canine Academy, and K9 Blesk is now fully certified in drug detection and patrol work. K9 Blesk was purchased from Connecticut K9 last December after the loss of Officer Perkins’ first K9 partner, Max. The Department’s newest K9 will be there as well. K9 Nitro and Officer Nick Alden are the newest members to the K9 Unit and will begin their training in January when they attend drug detection school at the Vermont Police Canine Academy. K9 Nitro was purchased from Hop River Shepherds located in Andover, CT.
Stop by West Lebanon Feed and Supply on Saturday, November 10th from 10AM to 2PM to meet the newest K9s!